DFS - Manage your business from anywhere. No more paper routes - No Problem! 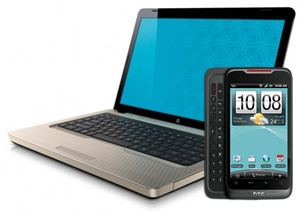 Single System Login - DFS remembers DIRECTV Handheld password so techs do not have to keep up with two passwords. Work Order Auto Import - When a tech clicks on a job in Handheld through DFS, the job is automatically upload into DFS. Simultaneous Line Closure - When tech closes the OLI line item in the Hand Held that line is captured and also closed in DFS. Routing with a map is so much better. Plan your daily routes quickly and easily with the use of a built in mapping tool. Calculates the mileage techs will drive to complete his/her route. Different markers to easily distinguish between AM/PM customers and technicians. 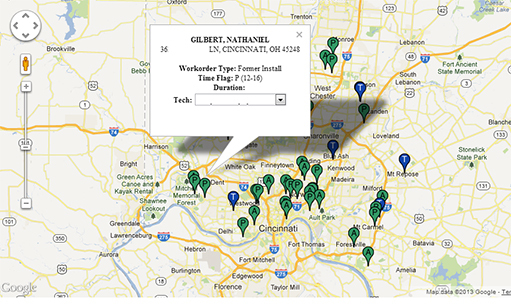 Click on the markers on the map to see the customer detail and to assign the job to the tech. Payroll made fast and easy. Tired of spending all your time on payroll? With DFS payroll system, you can verify all payments were received. Color coding making it easy to see at a glance which jobs were paid correctly and incorrectly. Cut your hours doing payroll dramatically. DFS is a web based DIRECTTV Contractor's software that was specifically designed for the Contracting and Sub Contracting Community to give every contractor the tools necessary in successfully operating and tracking daily work orders issued from DIRECTTV or DIRECTTV's HSP Network. You can run your business, Even when you are not in the office! DFS software was designed with your needs in mind. 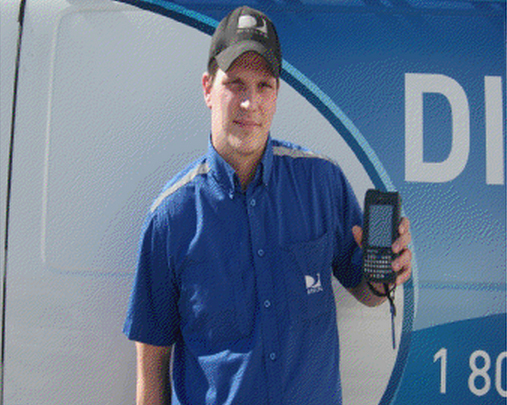 DFS is perfectly suited for Contractors and Sub Contractors that work in the DirectTV fulfillment industry. Inventory Management can be time consuming and inefficient without the right tools. Receive inventory with day time stamp in the software which will track aging days, by color coding all receivers, track the check out to technicians for HSP equipment and non HSP equipment, quickly pull a technician drop deduction report so there is no more, "I didn't buy that" or "I didn't receive it", view receiver track history. With DFS, you are able to take Full control of successfully managing your inventory, managing your technicians, managing your customers, work orders, and managing multiple locations from where ever you are as long as you have an internet connection. 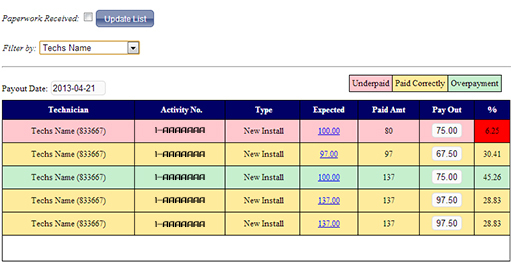 There is no need to install any software on your PC to use our DFS System. All you need is dependable internet connection. Payroll Calculation and Verification to insure you are paid for every job correctly. 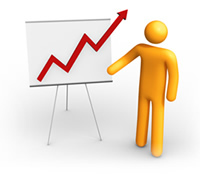 DFS is the most affordable option for managing your reports. You don't have to spend thousands of dollars to have the capability to run accurate professional reports. Our report management software allows you to get all the features you need without having to pay for "extras". With DFS you will be able to view many different reports that will aid in business operations ranging from inventory movement and history, equipment sign out reporting, equipment in inventory count for warehouse and technicians, consumption report and many other reports that are needed or requested by the sub contracting community using this software. DFS can create and assign technicians pay rate that ties into payroll reporting, view technician performance, track technicians daily activities through dispatch reporting, generate quick payroll for technicians based on completed work orders, and Technician personal login page which will give the technician detailed reporting of their truck inventory, drop deduction, and their work order history status. This will eliminate the disputes that technicians have about why they are not getting paid for a specific job or why their deductions are too much for drop materials. With DFS it's all there in their personal login page. DFS can track customer work order information which can be uploaded by the daily route log that the HSP provides your company daily. The work order can be scheduled days ahead and will show up on the dispatch board as the day of scheduled events. Detail customer history can be searched and recreated as well as the ability to create an internal Repeat Service which the software will generate a repeat service report on the technicians that caused the problem. This is to help aid the technician's performance in the future. Each work order will be closed internally by a line by line item. The process is similar to the original DIRECTV Siebel work order and at the same time will move inventory from the technicians truck in result will create a true consumption report. Dispatch board that is color coded so that with just a glance you know if your techs are enroute or onsite or if your customers have received a pre-call. Do post calls with ease with our built in Customer Satisfaction script. Dispatching Board to track open jobs to ensure your technicians arrive on time. In the ever changing world of satellite dish installation, you need a software that is flexible, yet built with a solid foundation based on the knowledge of the industry. I found that software in DFS. Fast, reliable, and web based, DFS helped our company expand months ahead of the competition. DFS, without a doubt was the driving force of our company. Since starting our company we have used several different systems to help track inventory and help with the day to day operations. After working with DFS for several months it has been the best thing since sliced bread for us. This system does everything from routing to payroll. I don't know how we ever survived without this software. We love it. Thank you to all the folks at DFS Software Solutions for creating such an invaluable tool. The best administration tool for my business, does it all from payroll, dispatch to inventory control. Really easy to use plus great technical support at all times to answer any questions you may have. 100% Reliable. Copyright 2019 - DFS Software Solutions Inc. All rights reserved.